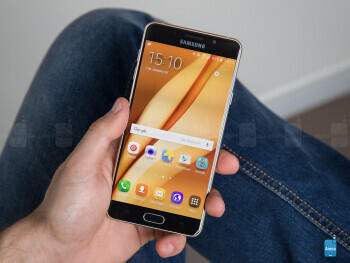 The Samsung Galaxy A7 (2016 edition, aka A7 6) launches early in 2016 to set the tone for mid-range phones: those that are not as expensive as the finest Galaxy S series and iPhones, but also a level above the Moto Gs of this world. The Galaxy A7 (2016) is a 5.5-inch smartphone – it's large, but probably not as big as it's screen diagonal would suggest. The first thing to know about the Galaxy A7 (2016) is that it looks and feels stunningly good, stylish. While carrying the _phone_ for a week or so while reviewing it, people noticed it and asked about it, often complimenting it. You know there are supposed to be some compromises with mid-range phones, but the one area where Samsung did not compromise was looks. The rest is TouchWiz running on top of Android 5.1 Lollipop on a Snapdragon 615 system chip with 3GB of RAM, a fingerprint scanner with support for Samsung Pay, a 13-megapixel camera with OIS and a fairly large, 3,300mAh battery. At the moment of this writing, the _phone_ is on sale in only a few European markets. 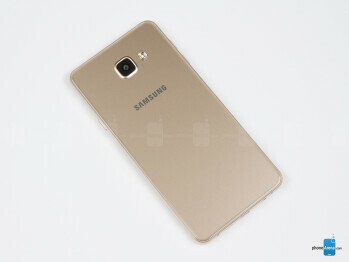 It is expected to become more widespread in February, while plans for US availability of the phone are unclear. One version with AT&T 4G LTE bands has passed FCC certification, though, so there is a chance that it might come to the States in the future. Now, let’s see how it all plays out in real life. Super stylish, eye-catchy design, very solid feel in the hand. Built to near perfection. 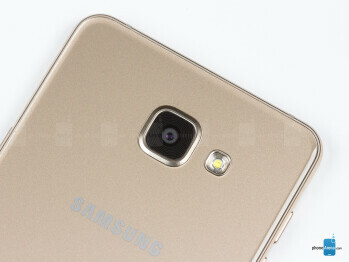 The Galaxy A7 (2016) looks a lot like Samsung’s current flagship, the Galaxy S6. The frame is made out of metal, the physical buttons are also made of metal, while the front and back are Gorilla Glass 4 with a slight curve towards the edges. The A7 (2016) feels monolithic in the hand, reassuringly solid. We’ve already touched on this in the intro, but let’s make it abundantly clear: this phone looks every bit as stylish and well made as the top phones out there and it’s impossible to tell just by the looks that we’re dealing with a mid-range phone. In the hand, it has some nice heft to it, but it’s not too heavy and does not tip over when you hold it. Despite rocking a glass on the back and front, it does not catch a lot of fingerprint marks and looks fairly clean, so you don’t have to frantically wipe it every few hours. In terms of color, it comes in a choice of gold, white, black and pink gold, and we have the gold version up for review. It’s also fairly compact for a 5.5” phone: its width is just 2.92” (74.1mm), while the popular iPhone 6s Plus that also has a 5.5” display has a width of 3.07” (77.9mm). The A7 (2016) is also not as tall at 5.96” vs 6.23” on the 6s Plus. Both phones are equally thin at 7.3mm, so big props to Samsung for making a 5.5” phone fit in such compact dimensions. The buttons are in the typical for Samsung layout: a large, physical home key (with a fingerprint scanner in it) below the display, a back button on the right and a multitasking key on the left (both are capacitive keys with a backlight that appears for a short while when you touch them). The lock key is on the right, while the two separate volume buttons are on the left, and all are made of metal and feel very clicky and quality-made. 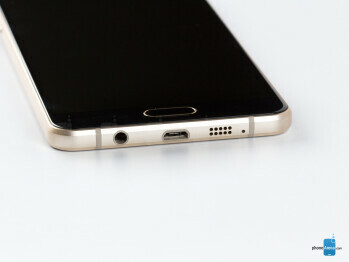 On the bottom, there is a microUSB port for charging, a 3.5mm headset jack and a speaker grill as well as a microphone. Up top, there is only a secondary mic. It’s worth noting that the phone does not have an LED notification light, so there is no way to know if you have a missed call or notification without actually turning the screen on. We can’t say we miss the notification light all that much: with the notification avalanche on modern phones, a notification light is also a big distraction, always urging you to pick up your phone. Sometimes it can be useful, though, so for many the lack of it would be a downside. This is a dual SIM phone: it features a hybrid SIM card tray on the right - you can either use this phone with two SIM cards, or use just one SIM card and use the second slot for a microSD card to expand storage. One good looking display with pleasing colors. The Galaxy A7 (2016) features a 5.5-inch Super AMOLED display with a resolution of 1080 x 1920 pixels. This makes for a sharp-looking display: at this resolution, it is nearly impossible to notice pixelization or any jagged edges to images on the screen. What about the colors, though? Samsung’s AMOLED displays come with the nice function that allows users to choose how the screen looks. The default ‘Adaptive’ display mode features unrealistically oversaturated colors and bluish whites, which come together for a very punchy, but wildly unrealistic, cartoony look to everything. We switch all our Samsung AMOLED displays to the ‘Basic’ mode (you do this by going into Settings - Display - Screen Mode), as this is the mode that conforms to the sRGB color standard, the de facto standard for all images and video. Sticking with Basic Mode and the sRGB standard means that you see images the way those who captured those images intended you to see them. Every other screen mode and standard results in images that get some sort of artificial boost that ruins the way those who took pictures and made movies intended for them to be seen. Great news is that in Basic Mode, the screen on the Galaxy A7 (2016) looks very good. Whites are just a tad on the green side, but for all else, this is a well balanced display. Outdoors, this is not the brightest of screens (peak brightness reaches just 369 nits), but it blocks out reflections fairly well, so we found it not all that uncomfortable to use. At night, it can go all the way down to the minimum level of 1 nit, which makes it easy on the eyes, something that is great for those who can’t fall asleep without their phone. The light sensor also works very well, set the phone to automatic brightness and it will adjust the levels very adequately. Viewing angles are also solid, but there is a pronounced color shift towards blue when you view the display at an angle. The first thing to know about the Galaxy A7 (2016) is that it looks and feels stunningly good, stylish. While carrying the phone for a week or so while reviewing it, people noticed it and asked about it, often complimenting it. The rest is TouchWiz running on top of Android 5.1 Lollipop on a Snapdragon 615 system chip with 3GB of RAM, a fingerprint scanner with support for Samsung Pay, a 13-megapixel camera with OIS and a fairly large, 3,300mAh battery. At the moment of this writing, the phone is on sale in only a few European markets. 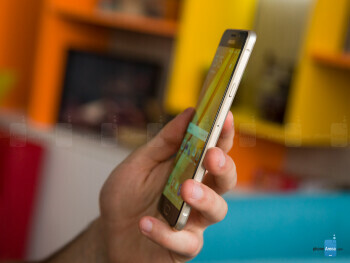 It is expected to become more widespread in February, while plans for US availability of the phone are unclear. One version with AT&T 4G LTE bands has passed FCC certification, though, so there is a chance that it might come to the States in the future. Now, let’s see how it all plays out in real life. Ouch, TouchWiz. Ouch, Android 5.1. It hurts, Samsung. It really hurts to see a phone released with “2016” in its name come with no Android 6.0 Marshmallow on board. Will the A7 (2016) ever get Android 6.0? Samsung is likely to tell you that it probably will, but given the company’s history with Android updates, just don’t wait for it or the wait will be excruciating. It might take half a year, it might take a year. Nobody seems to know and it’s a shame. 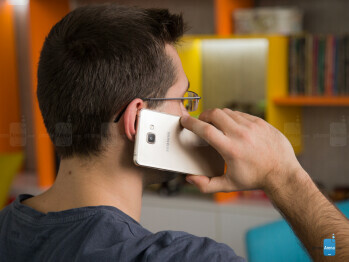 Don’t underestimate this: this is a big problem with all phones that don’t carry the Galaxy S or Galaxy Note moniker. Samsung seems to release them and totally forget about their existence the next day. Or put them on a backburner. They are second class citizens and they get treated as such. Then, there is TouchWiz. Sure, it has improved. Sure, it has become leaner, BUT it’s still cumbersome. It seems to run smoothly for a moment, and then starts lagging and stuttering the next. It does not run consistently. There is the typical for Samsung stutter right after you press an icon: for a split second everything freezes and only then the app starts appearing. This is consistent everywhere and with all apps in TouchWiz, call it microlag, call it stutter, but it’s there. Then, there is the Flipboard magazine. It’s enabled by default and sits at the left-most panel on the home screen. You will immediately notice that every single time you go there - whether the app needs to refresh or not - it freezes your phone for a second or two (or more). This is quite annoying, so despite the fact that the Flipboard app is very tastefully done and serves interesting, well curated news, we’d rather disable it (long hold the home screen, swipe to the leftmost screen and uncheck the box at the top). For all else, TouchWiz is a familiar affair with its colorful, cartoonish style and a mixture of influences – Material Design floating buttons are mixed with the Tizen-inspired settings menu and notifications drawer, and all of that comes together in a weird, slightly incoherent aesthetic. It lags and stutters way too often. Snapdragon 615 seems insufficient for this phone and if you play games on mobile, this is definitely not the right device. We’ve already mentioned it before, but let’s make it perfectly clear: the Samsung Galaxy A7 (2016) stutters and lags every once in a while and it’s not a speed demon. In fact, its performance is its weakest part in our opinion. It’s not that the phone is terribly slow, but it is inconsistent and when it stutters, you notice. So why is that? The answer to that one is complex: TouchWiz is on one hand of the equation, while on the other is the Snapdragon 615 with its pedestrian performance. The chip itself is made on the 28nm manufacturing node (top-end phones like the Galaxy S6 have their chips made on more power efficient nodes, like the 16nm FinFET) and there is 3GB of RAM on board. An octa-core chip with four Cortex A53s running at up to 1.5GHz and four more A53s clocked lower, at up to 1.2GHz, it does not seem well fitted to the 1080p screen and the load of the TouchWiz-based Android. Note: Reporting tools agree that the Galaxy A7 (2016) does indeed feature the Snapdragon 615 (MSM8939) system chip, but Samsung itself has not officially disclosed what kind of processor it uses in this phone. 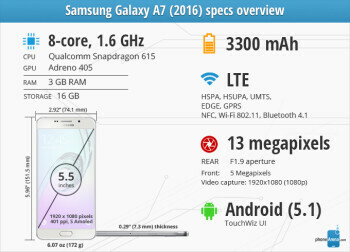 In some markets, the A7 (2016) will reportedly ship with a different processor, the Exynos 7580 with Mali T720 GPU. 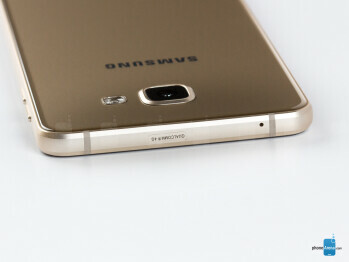 The Exynos version should have comparable performance with the Snapdragon model. We have put together a quick video to illustrate the way the Galaxy A7 (2016) runs and what the stutter looks like in real life. Digging deeper in the performance issues, we look at benchmarks. The Snapdragon 615 system chip is found in devices like the honor 5x, Huawei P8 Lite, HTC Desire 820, and it’s easy to spot that the benchmarks in fact confirm that in terms of computing power, all these handsets are on the same footing. However, most of these phones were released last year and featured a 720p display, which allowed more headroom for the Snapdragon 615 chip. Having a 1080p display shows in the benchmark: you can clearly see how the scores are dropping for all on-screen tests. At this point it’s quite obvious that the Snapdragon 615 system chip is the main culprit behind the uninspiring performance of the Galaxy A7 (2016) and one if its weakest points. This is especially true for games: the A7 will stutter and drop frames, and if you play games on your device, this phone will not be a good choice for you. Internal storage comes in at 16GB on the A7, of which around 11GB are available to the end user. Luckily, the phone has a hybrid dual SIM/SIM+microSD card slot, so that you can insert your own card to bump up the storage allowance here. Web pages render a bit on the slow side. 4G LTE is on board, but band support is fairly limited. Yay for NFC and Samsung Pay support! Surfing the web on the Galaxy A7 (2016) happens via the built-in Samsung browser. We had no major issues, but neither did pages load lightning fast: in fact, heavier pages rendered a bit on the slow side. You also have Google’s mobile Chrome browser pre-installed, and the experience with it is similar. It’s important to know that currently, the Galaxy A7 (2016) is not officially sold in the United States. The review unit we have is a phone with limited 4G LTE connectivity bands, mostly covering the European market. The unit we tested supports bands 1 (2100 MHz), 3 (1800 MHz), 5 (850 MHz), 7 (2600 MHz), 8 (900 MHz), and 20 (800 MHz), but lacks the key 2/4/12/13 and 17 bands that major U.S. carriers use. However, listed at the FCC is a different model (SMA710M) that has passed certification and is registered with support for bands 2/4/5/17, which matches AT&T’s bands, so it is possible for that particular model to land in the U.S. at a certain point in the future. The phone also supports dual-channel Wi-Fi so that you can avoid the often congested 2.4GHz Wi-Fi channel in urban areas and switch to 5GHz if your router supports that. In terms of connectivity, you also have NFC support, as the Galaxy A7 (2016) supports Samsung Pay in select markets. For wireless connectivity, Bluetooth 4.1 support is also on board. Very fast and convenient camera experience, but image and video quality is good, not great. Also, lack of 4K video is a disappointment. The Galaxy A7 (2016) features a 13-megapixel rear camera with optical stabilization (OIS) and wide, f/1.9 aperture that allows more light in than your average smartphone. Up front, there’s a 5-megapixel selfie shooter. The camera experience is one of the best you can have on a smartphone at the moment. The phone supports quick launch for the camera: just double click the home button from any place (even when the phone is locked) and the camera app starts right away. The camera interface is extremely convenient: it has separate video and photo capture buttons, allows you to pause the video (unlike pricier devices like the iPhone, for instance), the button to switch between the front and rear cameras is conveniently within reach. It’s worth noting that by default the phone captures images in 16:9 aspect ratio and 9.6-megapixel resolution. You can switch that to capture in 4:3 aspect ratio and 13 megapixels, which gives you more space to capture up top and on the bottom. Interestingly, Samsung has also included a 1:1 aspect ratio mode at 9.5 megapixels for old-school Instagrammers. Image quality on the A7 (2016) is satisfactory, but not great. The main issue we have with pictures shot on the main, 13-megapixel camera is that in daylight, the phone handles brighter light poorly, burning the whites, and its dynamic range suffers as a result. We have used the popular iPhone 6s as our reference camera to better illustrate the issues: notice how colors appear less saturated and less punchy, but maybe a bit more natural on the A7. The blues in the skies are overblown on the iPhone 6s, but give images a very dreamy look, while the A7 tends to burn the highlights (notice the sky in the picture with the bench, the burned out sky in the boat statue, the overblown highlights in the mermaids picture). Detail is also a bit mushier and not as sharp on the Galaxy A7. The differences are way more noticeable in low light. Despite having optical stabilization and wide, f/1.9 aperture, in lower light, images still turn out blurry way too often as the phone defaults to some very low shutter speeds in such conditions. The flash is adequately strong to light up images and does so fairly evenly, but it does introduce a cold color cast that throws colors far off, and overall images with the flash on don’t look all that appealing because of the colors. Selfies on the 5-megapixel front shooter of the A7 (2016) turn out okay, but not great. 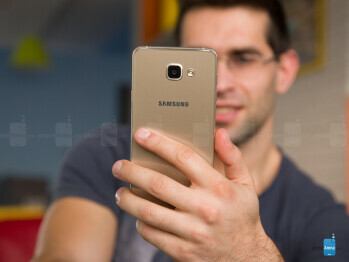 While 5-megapixels for the front camera might sound like an appealing number, selfies turned out blurry way too often. Colors are fine, skin tones look natural (if not a bit pale), and it’s worth noting how much wider this selfie camera is than the traditional smartphone selfie cam. This makes it easier to capture an image of a group of people, but when you are photographing just yourself, it seems a bit too wide. Disappointingly, the Galaxy A7 (2016) does not record video in 4K. It maxes out at 1080p at 30fps with a bitrate of around 17Mbps. Video quality is decent: detail is not too plentiful, especially when compared with the super sharp 4K recordings, and while in general colors are fine, the phone often overblows the highlights. Auto-focus is a bit trippy at times and you can notice how the optical stabilization system does its job: in the center of the frame, videos are usually rock solid, but you can notice a wiggle towards the edges of the frame. In an era of YouTube and Facebook videos, as well as Spotify and Apple Music, the default music and video players are getting less and less use. Many people still use them, of course, but there is really nothing new to be said about the dedicated music and video apps on the A7 (2016): they get the job done with support for most major formats and no issues with playback. The music app auto-categorizes your songs, and it also has a useful folder view. Tap on the More button and go to SoundAlive to make quick adjustments to the bass/treble as well as instrument/vocal balance, or tap on details for a full-on equalizer. You can take a look at the screenshots below for an illustration of what the experience is like. The photo gallery is still something that practically everyone uses on a daily basis. With the A7 (2016), it’s the typical Samsung affair: you can resize your image thumbnails by pinching in and out - make them small to easily go back in time, or large to have a better preview. Some quick editing options like cropping and basic effects are also available, but we’d rather use an image editing app like Snapseed for that. Loud, but not particularly rich sounding speaker. Music played through the speaker gets fairly loud on the A7 (2016), but there is a very noticeable metallic rumble and a slight distortion, especially with the highs, and there is not much depth to the sound. Of course, we are speaking in comparative terms here, comparing the sound quality against that of other phones where we have heard much clearer sound in the highs and more depth in the lows. When you plug in headphones in the 3.5mm jack, you can expect much better quality of course. The phone comes with a pair of white ear buds by Samsung with a glossy finish and a three button control pad. They fit snugly in the ear (there is just one size rubber tip, though) and are lightweight and comfortable to wear. Sound quality is not bad for a pair of free headsets, but of course it's nothing stellar..
We had no major issues with call quality on the A7 (2016). In calls, voices of our callers sound very natural and clear, with sufficient volume to be audible in even some noisier environments. The same is true on the other end of the line: voice through the mic is carried out in a fairly clean manner, with no major gripes. Great battery life, gets us through even the busiest of days without worrying about running out of juice. 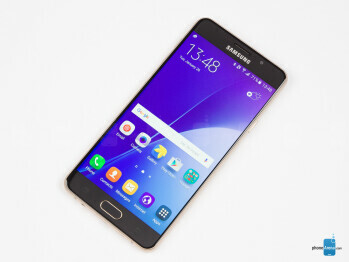 The Samsung Galaxy A7 (2016) features a 3,300mAh battery that is not user removable. But how long does that battery last? We ran the phone through our battery life test and the result is nothing short of stellar. With some 9 hours and a half of battery life, this is one of the longest lasting phones we’ve ever tested. Then, we have real-life impressions. The Galaxy A7 (2016) easily lasts a full day, even when you put it through its paces, and on average we got around a day and a half of use. Your mileage may vary, but you should get somewhere around this as well. Given that a 3,300mAh battery is rather large, it’s important to measure how much it takes to charge the phone back from zero to 100% with the stock wall charger. Luckily, Samsung provides a Fast Adaptive Charge wall plug which puts out 15 watts of power to juice up the battery faster. It takes one hour and forty minutes to fully recharge the phone, which should be fast enough for most. The Galaxy A7 (2016) is expected to go on sale soon at prices north of $440 (400 euro). It will not be available in the United States, at least initially, but could arrive stateside at a later point. At such a high price, it goes in direct competition against some extremely well performing phones. First on this list is Samsung’s own Galaxy S6. The 5.1-incher is smaller, but if you don’t care all that much about the screen size difference, the S6 is better in every way: it has a much faster processor, runs much faster, has a vastly superior camera that supports 4K video, and will get updated to Android 6.0 Marshmallow much faster. At just a slightly higher price than the A7 (2016), the latter is at a huge disadvantage when you compare the two. Next on the list is the Nexus 5X. The 5.2-incher by Google is more affordable than the A7 (2016) in the United States, and a bit more expensive than it in Europe and the rest of the world. The Nexus lacks the design sophistication: it’s a plastic phone that feels a bit hollow and nowhere near as stylish, but it has a much faster performance, a vastly superior camera with 4K video support, the promise for super fast Android updates and USB Type C for charging. 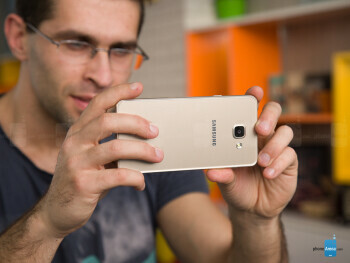 If you can live with its design, it also feels like a much better buy than the Galaxy A7. Then, there is the Moto X Pure. The 5.7-incher is again more affordable than the A7 (2016). It does not look nearly as well made and is bulkier, but also has a very good looking display, much cleaner and faster performance and a camera that seems to be a bit better, which again puts it in a favorable position. Then, we can look at other affordable devices. The newly launched honor 5X features the same Snapdragon 615 system chip that powers the A7, and it also has a very stylish and solidly constructed metal body. At the same time, it costs less than half the A7! True, it does come with a fairly disappointing custom skin, but with a price of just $200, this only illustrates the slightly exaggerated price premium that the A7 comes with. However, the objective reality does tend to catch up with all subjective perceptions after time. And the objective reality is that this phone runs disappointingly inconsistently, often stutters, and features a slow chip that Samsung should use on more affordable phones than this one. Camera performance is decent, but not great. And then, you remember about the sad state of Android updates on everything but the top Samsung phones, and the case for the A7 (2016) becomes even less convincing. If you do not play games on your phone, though, and value the style and looks of a device above all, the Galaxy A7 (2016) should definitely be on your list of considerations. Not so much for anybody else.